It’s a whole lot of butter, sugar, flour. Like, I don’t think you understand how much of those three things you’re going to end up using. And spilling. And cleaning up. Eventually stuff just starts blurring together; the sound of the mixer, the stray sprinkles that fall on the kitchen floor, the empty eggshells and used butter wrappers, the measuring cups and measuring spoons that you continually have to rinse out and dry between recipes, the sound of the oven buzzer going off telling you to take the next ‘batch’ out. You run out of counter space and end up having to get ‘creative’ to find spaces to let your bakes cool off and or set up. You go through countless rolls of paper towel, parchment paper and aluminum foil. Also, your feet swell and ache from standing up for hours. I pretty much turn into a mixing, measuring, baking Elf for this series. But somehow, I still end up loving it. Spoiler Alert, guys: as much as I love doing the series, I actually don’t end up keeping/eating most of the food I bake. I mean, come on: it would just be a bad idea for me to keep 12 batches of baked goods in my house. I probably wouldn’t be able to fit out the door of my house if I did that. Plus, Christmas is the season of giving, right? So, what I usually try and do is give away as much of the treats as possible to people I know; neighbors, family, friends. I send it to Christmas parties and potlucks. There’s a lady in my grandparents church who gets the bulk of them to pass out to kids in her neighborhood. In short, when you do this much baking at a time, it’s just best for you to share the wealth…most of the time. Except, that’s not exactly what happened with these. This time around, I didn’t want to “share the wealth”, I wanted to hoard it. So I did. These cookies, I kept. All for myself. That’s how yummy they are. It may have something to do with my being somewhat of a coffee addict, but I seriously loved these cookies. They’re soft, fudgy and rich. The combination of chocolate and coffee works SO well here. The flavor really is reminiscent of your favorite latté at a coffee shop. Because I’m such a huge coffee fan, I did bump up the amount of instant coffee in my dough to 4 tbsp. 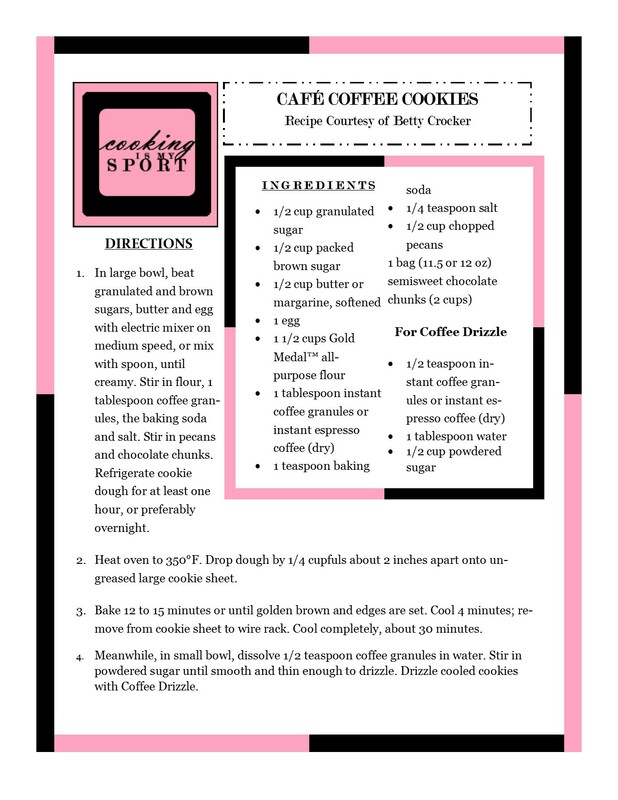 However, because I know that not everyone is as fond of coffee as I am, I kept the printed recipe as I originally found it. (But if you love coffee as much as I do, I recommend bumping it up). There’s only two more days left of our series, guys. Whoop whoop. In large bowl, beat granulated and brown sugars, butter and egg with electric mixer on medium speed, or mix with spoon, until creamy. Stir in flour, 1 tablespoon coffee granules, the baking soda and salt. Stir in pecans and chocolate chunks. Refrigerate cookie dough for at least one hour, or preferably overnight. Heat oven to 350°F. Drop dough by 1/4 cupfuls about 2 inches apart onto ungreased large cookie sheet. Bake 12 to 15 minutes or until golden brown and edges are set. Cool 4 minutes; remove from cookie sheet to wire rack. Cool completely, about 30 minutes. Meanwhile, in small bowl, dissolve 1/2 teaspoon coffee granules in water. Stir in powdered sugar until smooth and thin enough to drizzle. Drizzle cooled cookies with Coffee Drizzle. They really ARE Courtney. I LOVED how these came out. Thank you! The recipe looks delicious, and your post is hilarious! Love it. So, I have already sent you a fan feedback on other recipes you’ve posted but these cookies are spectacular! I was baking a test batch last week to see if I would put them on my Christmas roster. I have already made 2 batches but my family inhaled them! I will make these all year long because they are far too good to only have during the holidays. Thanks again!